I love apples. When I was a kid, my dad would let me pick out 5 or so items (anything I wanted) from the supermarket as incentive for keeping him company while he did the grocery shopping, and a bag of apples was always in my top 5. I realize now that I was a really weird good kid - I can only hope that my future children will be just as good at choosing healthy food over junk! Anyway, fresh apples is one of the things I love most about fall in New England. So many varieties to try, each with unique flavors. Last weekend, after I picked up several pounds of apples from the farmers' market, I realized that I'd never get through them all unless I started cooking with them in addition to just eating them plain. 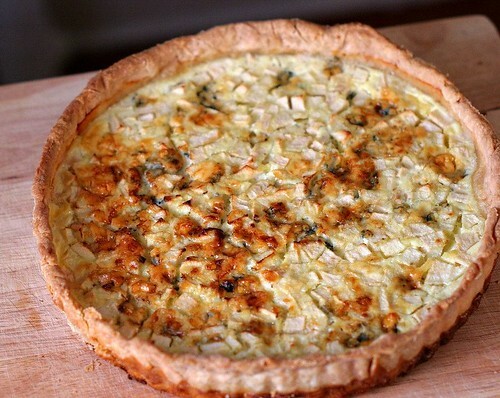 This Gorgonzola-apple quiche from Dorie Greenspan's Around My French Table was the first recipe that caught my eye. I love the combination of Gorgonzola cheese and apples in salads and now I can report that it works just as well in quiche. The quiche really was lovely - very tasty, though not quite traditional, with chunks of sweet-tart apple, salty cheese, and sweet onions. It only used up one apple though...I might have to make it a few more times to get through the rest of the ones I bought! Do you have any savory apple recipes to share? While the quiche filling came from Dorie Greenspan's recipe, I used Julia Child's quiche dough recipe because I've made it in the past with great success and it's delicious. Place dry ingredients in the bowl of a food processor. Add chilled cubes of butter and chilled shortening and pulse 4-5 times, until mixture resembles coarse meal with some pea-sized lumps of butter. With processor running, pour in ice water. Immediately pulse several times until dough begins to form a mass on the blade. If dough does not form a mass, dribble in more water and repeat. As soon as dough forms a mass, transfer it to a lightly floured counter or other work surface. Divide dough into 5-6 pieces. For each piece, use the heel of your hand to rapidly press the pastry down and away from you with a firm, quick motion. With a pastry scraper, gather together all the dough and then shape it into a relatively smooth round ball. Flatten into a thick disk, sprinkle lightly with flour and wrap in wax paper or plastic wrap. Freeze dough for 1 hour until or refrigerate anywhere from 2 hours to overnight. Note: at this point, dough can be frozen (wrapped in wax paper and kept in a plastic bag) for up to a couple months. Put a rack in the center of the oven and preheat to 400 deg F. Butter the inside of your tart pan. Either roll the dough onto your rolling pin and unroll it over the pan, or fold it into quarters and unfold over the pan. Lightly press the dough onto the bottom of the pan and then lift the edges of the dough and work it gently down the inside edges of the pan, taking in some extra dough (about 3/8 inch) all around (this thickens the walls of the tart). Trim the edges by rolling your pin over the rim of the pan. Prick the bottom of the pastry with a fork at 1/2-inch intervals. Line the pastry with foil, press foil well against the sides of the pastry, and fill with dried beans, rice, or pie weights. At this point you can refrigerate until later. Otherwise, bake on the middle rack of the oven for 8-9 minutes (I did 9) until dough is set. Remove foil and beans, prick bottom of pastry again to keep from rising, and bake for 2-3 minutes (I did 3) more until shell is beginning to color and sides are just starting to shrink from the sides of the pan. Remove pan from oven. After cooling, the pastry can be kept for several hours before filling. Put a rack in the center of the oven and preheat to 400 deg F. Line a baking sheet with parchment paper. Melt butter in a small skillet over low heat. Add onion and saute until onion is soft but not colored, about 10-15 minutes, then remove from heat. Place the partially baked pastry shell on the baking sheet (this will catch any drips). Spread the onion evenly over the bottom of the crust. Scatter the apple pieces over the onion and top with the crumbled Gorgonzola. Beat the eggs, milk, and cream together until well blended and season with salt and white pepper. Pour the egg mixture into the tart pan. Place the baking sheet in the oven and bake for 40-45 minutes, until the filling is puffed all over (make sure the center is puffed), lightly browned, and set. Transfer the quiche to a cooling rack and allow it to cool for at least 5 minutes. 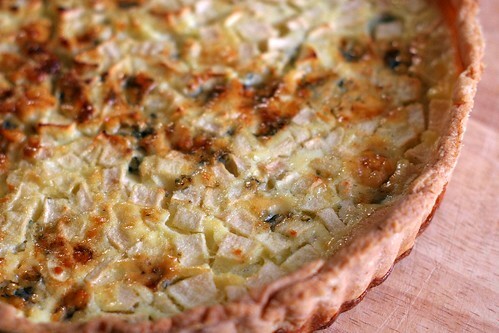 Remove the sides of the tart pan and slide quiche onto a platter or cutting board. Serve warm or at room temperature. Leftovers keep well in the fridge for 2-3 days. What a great combo! I never would have thought to combine eggs and apples - but sounds like it really works! this is just beautiful and also looks absolutely delicious! Mmmm, this looks so good! I keep buying apples every time I go into a store and now I have way too many and have been looking for savory recipes to use them in. Also, I love that cookbook, but don't have a copy yet, so thumbs up all around for this recipe. It was great to meet you tonight!